Italy offers a wide natural patrimony, including several Lakes, most concentrated in the Pre-Alpine and Alpine area. They are stunning backdrop for your Wedding on the Italian Lakes. Many writers have dedicated their words to the majesty of those lakes set between wooded walls and snow-capped peaks, filled with aristocratic Mansions, Castles and ancient Palaces. Garda Lake is the bigger among the Italian lakes, and it is placed between three regions: Lombardia, Veneto and Trentino Alto Adige. It is a natural lake formed by the glaciers at the end of the Ice Age. The northern area of the Garda lake is narrower and surrounded by high Mountains, characterised by a nice breeze during summer, that makes it the perfect area for windsurf and kite surf. The southern part is more plain and wide. The whole lake shore is encircled by a route which allows cars, but also bikes and pedestrians, to travel around the lake. The most important and popular spots for Weddings on the Italian Lakes are Desenzano del Garda, Sirmione (a fortified town famous for the thermal sulphur springs) and Limone (known for lemon cultivations), but the lake is characterised by many small Villages with peculiar features that attract a myriad of tourists. Como Lake is considered the most fascinating of the three major lakes, maybe thanks to Alessandro Manzoni’s famous novel set in 1628 ‘I Promessi Sposi’, (in English ‘The Betrothed’) which tells the story of an engaged couple that struggles to finally be married. 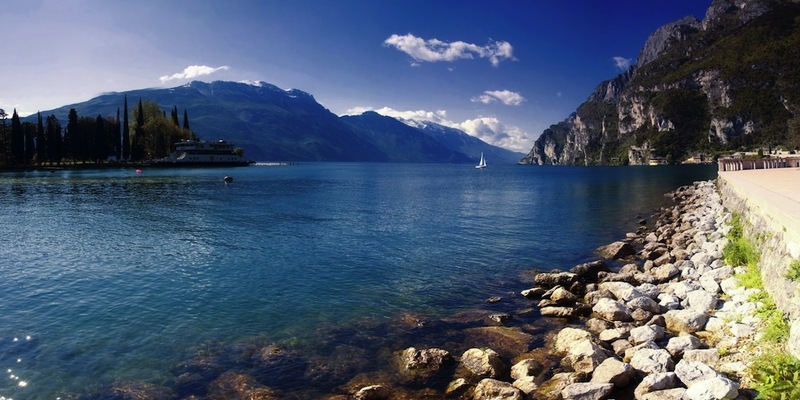 The lake has a Y shape which creates three different branches, the southwest area is called Como Lake, the southeast is the Lecco Lake and the northern part is the Colico Lake. There are many villages on the shores of the lake: Bellagio, famous for its setting at the intersection of the three branches, where you’ll find a former days atmosphere walking along the paths of the village and under the lakefront arcades, full of small shops and trattorie; Tremazzo where you will be delighted by low rise houses, elegant shops, nineteenth-century residences; Varenna a quaint village placed on a small promontory on the eastern side of the lake, striking hamlet made of steep lanes and long steps, that lead to the central square characterised by the a fourteenth-century church dedicated to San Giorgio. Lake Maggiore, more than Como Lake and Garda Lake, maintained its Belle Epoque charm. It is positioned between two Italian Regions (Lombardia and Piemonte) and Switzerland. Lake Maggiore’s weather is generally mild, and it is known for its Mediterranean-like climate where tropical and sub-tropical plants grow year-round. Rainfall is heaviest in May and lowest during the winter months. The temperatures are cooled down in summer by the breezes which blow across the water’s surface changing its colour. The Italian Lakes are ideal for a destination wedding in Italy. Spectacular tiny islands named Isole Borromee belong to this lake, among which there are Isola Bella, Isola Madre, Isola dei Pescatori, Isolino di San Giovanni and Isolotto della Malghera. On the shores of the lake we can find several small Towns, full of history and art such as Stresa, Verbania, Cannobio e Arona.